This simple concrete temple in a village near the Indian city of Pune is topped with a pyramidal roof and incorporates a channel that allows ceremonial holy water to flow out into its lush surroundings. 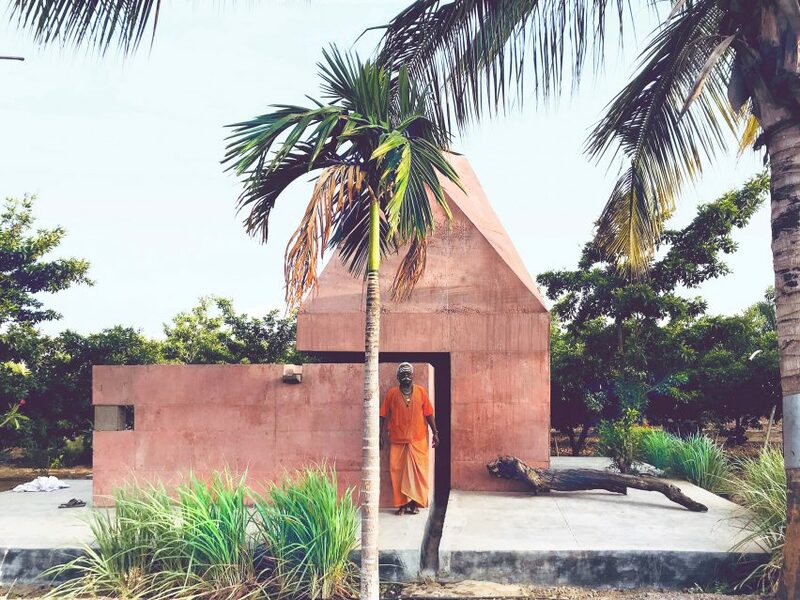 Designed by locally based Karan Darda Architects, the temple is located within an orchard of chikoo trees in a traditional farming region in the western Indian state of Maharashtra. The temple is dedicated to the Hindu deity Shiva and was built for the area’s farmers to use for daily worship. The building provides all the essential spaces required for worship but reinterprets the historical precedents of Hindu temple architecture by combining it with the region’s vernacular architecture. 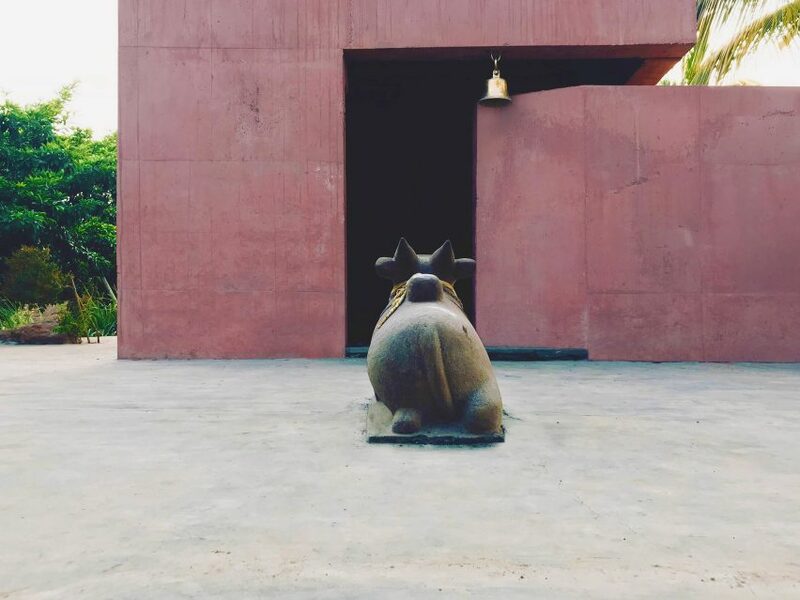 “The design intends to look like a sculpture and is a result of careful extraction from the traditional forms, put together in a simpler way so that the locals could easily associate themselves with it,” Karan Darda founder of Karan Darda Architects explained. 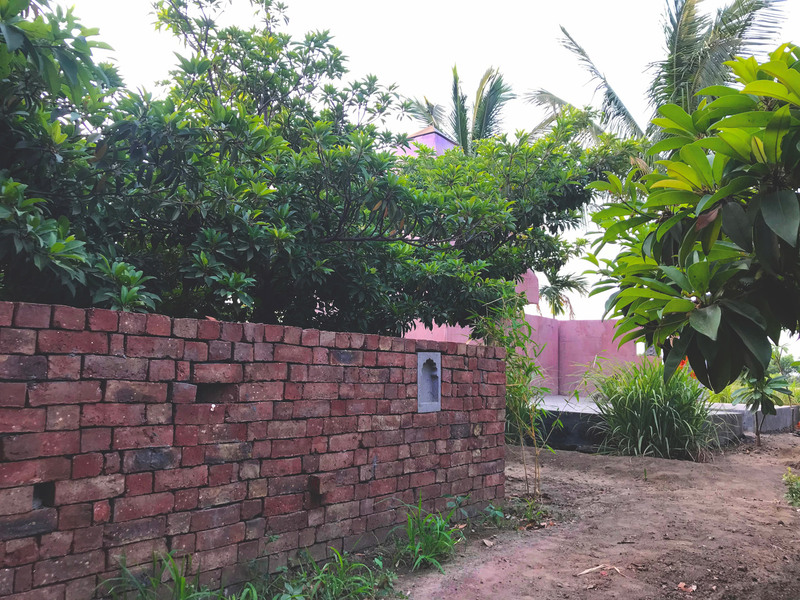 A simple red-brick wall lines the dirt track leading towards the temple, which is tucked in among the trees to partly conceal it from visitors and passers by. 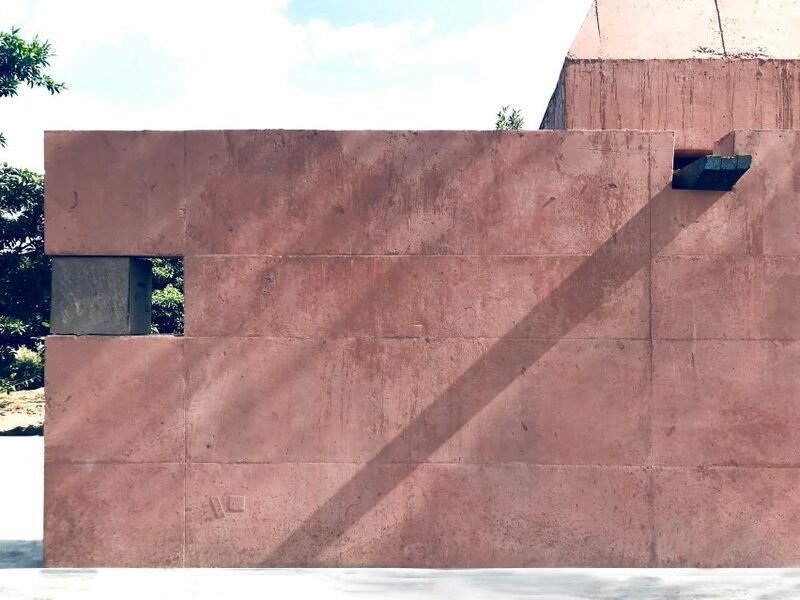 The building is constructed from concrete with a reddish-orange hue that matches the colour of the brick and surrounding earth. Its square base twists upwards into a triangle at its apex, creating a roof with a dynamic five-sided pyramidal form. Typical Hindu temples feature an inner sanctum reached through one or several porch-like structures called mandapas. However, this simplified version has a small sanctum that opens directly onto the surrounding concrete plinth. 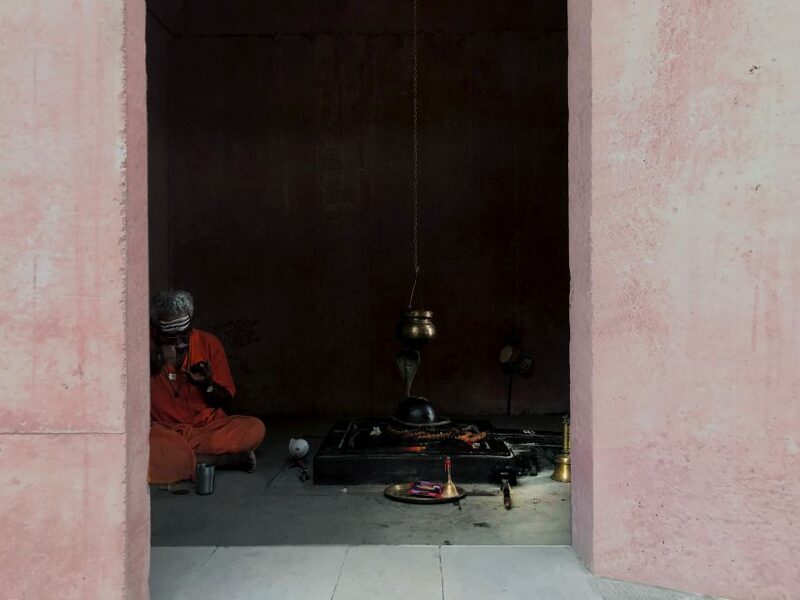 An angled opening in one of the walls forms the entrance to the sanctum, while a small adjoining meditation space allows users to stop in for a quick prayer before going back to work. 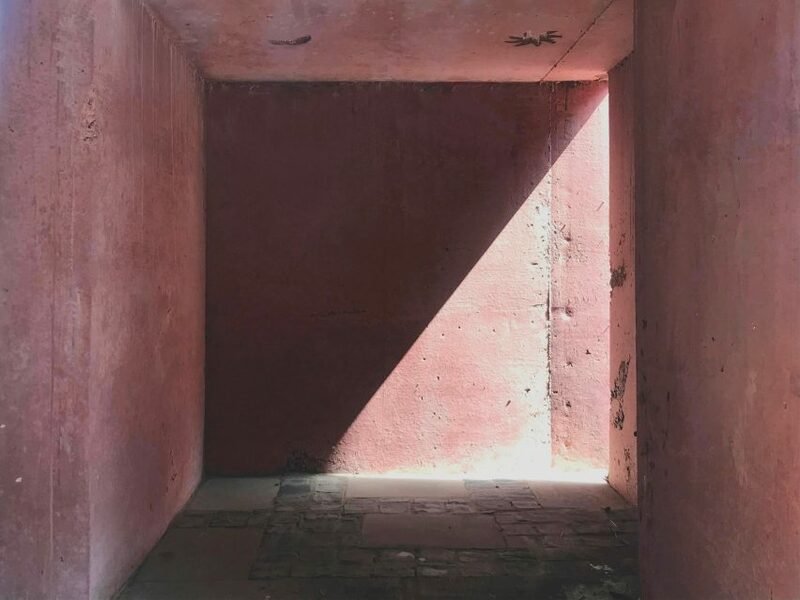 Apart from the entrance, the only other opening in the temple’s solid exterior is a slit in one wall that allows a breeze and a shaft of daylight to enter the internal space. One of the walls is pulled out to create space for the meditation area. This simple intervention breaks up the overall mass and produces a cantilever where it meets the entrance opening. The open slit intersects with a channel that continues through the concrete base. Holy water poured over a likeness of Shiva during the worship ceremony is directed into the channel and flows out from the temple onto the ground outside. At the Venice Architecture Biennale 2018, the Vatican City presented a series of woodland structures aimed at investigating the meaning of the chapel.